In the early 1980's, few comics were regarded as highly as the "X Universe" that Chris Claremont had created. He had made a world that drew readers in magnetically, pulling them into their orbit, and after successfully soft rebooting "Marvel's Merry Mutants," Claremont was able to use that trajectory to successfully launch numerous other franchises out of the X-Universe. Wolverine would get his own solo series a few years closer to the 90's, but Claremont created brand new mutants and heroes in books such as Excalibur and X-Factor. Then, in a push to bring a new class of younger heroes into the spotlight, he created The New Mutants. The New Mutants detailed Charles Xavier gathering a new team of children with powers together, determined to guide them down a different path than his legendary X-Men. For the first year or so, the book was solid and fun, another promising entry into the Marvel pantheon. Then, in issue #18, gonzo comic artist Bill Sienkiewicz took over on interior art and with the script of Claremont at his side, the two created was is arguably one of the most daring arcs in comic book history. "The Demon Bear Saga"
The New Mutants themselves were already different than the X-Men. Created in a different era, these children were much more realistically diverse and grounded. Not only that, their power sets were not necessarily the norm. While the team still had traditional comic book powerhouses such as Cannonball and Sunspot (both of whom were riddled with their own teenage hormonal emergencies and familial hurdles), the team also had Wolfsbane, a conflicted devout Catholic "werewolf" and Dani Moonstar, a Native American huntress who had the power to summon thoughts and fears as corporeal beings. Coupled alongside Magik, a pre-teen who was the mutant queen of the demonic Limbo with the ability to transport through space and time, and Magma, a lava fueled teen out of time who was raised in a society that was stuck in Ancient Roman times, and it was safe to say the New Mutants were a darker and flawed version of their older compatriots. 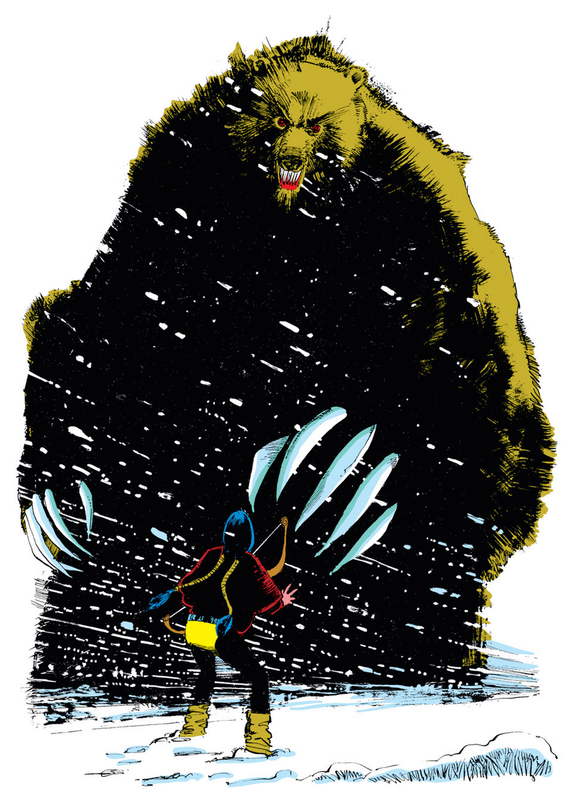 That premise alone is enough to get one excited about the upcoming New Mutants film but the fact that they are drawing heavy inspirations from "The Demon Bear Saga" is contagiously exciting. The story was grim, Dani Moonstar hunting a literal demon bear who exists outside our plane of existence, to be mauled and thrown into a medically induced coma as doctors struggle to safe her life. As this is happening, the other mutants are trapped in the hospital, creating a unnerving sense of confinement, searching for a way to defeat the ursine evil while also fighting to save their friends life. While Claremont creates a compelling and urgent script, Sienkiewicz is the catalyst of greatness. Highly unconventional in his style, wildly frenetic and spastic in his stylings, the work that Sienkiewicz translates from his pen to the page is literally a horror masterpiece. Teamed with colorist Glynis Wein, the duo use dark inks and broad swiping technicolor brushes to bring to life something that will never be replicated again. The sense of perspective the entire time is intimidating, the bear always standing as a goliath and monstrous figure over these growing teens, and the stuttering stylings of Sienkiewicz never allow the reader to find a place of ease. Now with this being said, New Mutants is not lifting that story, simply trying to carry over that style. But that's incredibly promising. With the known plot being about the children trying to escape a facility where they are being held against their will, this is a setup that could easily capture the same sense of claustrophobic dread seen throughout that famed run in the comics. While Magma is absent from the line-up, the rest of the core group is present and is being led by genre up-and-comers Anya Taylor-Joy and Charlie Heaton, as well as fantasy vet Maisie Williams. Taylor-Joy has already created a name for herself in Split and critically acclaimed The Witch, and it's exciting to see what kind of vulnerability she will bring to the role of Magik. Heaton, best known for his part of Jonathan Dyers in Netflix phenomena Stranger Things is sure to bring a nervous charm to the bombastic Cannonball and Arya Stark of Game of Thrones fame looks to have the same timid ferocity of the emotionally fragile Wolfsbane. Now, I know some of you may be throwing shade at the director of choice, Josh Boone. Boone is the director behind sappy young adult adaptation The Fault in Our Stars and also wrote and directed the criminally underrated Stuck in Love. Boone is however the lynchpin that makes this such an exciting prospect. While it is drastically different than what is in his traditional wheelhouse, Boone has the ability to create the most integral piece of the puzzle. Realistic relationships. In both films, Boone is able to craft stark and crisp friendships and romances that create emotional stakes. This is key to making New Mutants work. While it's awesome to know we will see Cannonball become nigh invulnerable while blastin' (a favorite Claremontism of mine) and Magik most likely pull the soul sword of a portal to Limbo, what is going to make this movie work above all else is the interpersonal conflicts that these characters have. Dialogue, body language, chemistry. These are the ingredients that need to mesh to make this movie not just another superhero movie, but an enjoyable and believable New Mutants movie. Then, perhaps, best of all is the fact is that everyone attached to the project has the same message. This is not a superhero movie. It's a horror movie with superheroes in it. Drawing comparisons of "Stephen King meets John Hughes" can't help but elicit a buzzing sense of elation in fans of comics, horror, and teen drama. To move even further past that, Boone has stated that his goal is to create a prestige style horror film, akin to iconic surrealistic classics such as Rosemary's Baby and The Shining. WHAT?! You're telling me that you're making a horror movie, inspired by the slow burn tension filled classics of the genre, based on the work of perhaps superhero comics greatest living writer and an artist who finds his home somewhere between Ralph Steadman and dadaism. Sign. Me. Up. I'll leave you with this wrap up. "The Demon Bear Saga" is one of the most truly terrifying runs in Marvel comics history. The art that Sienkiewicz will never be matched, it's raw and real and palpable, it's alive. Boone has shown he is a master at creating believable characters and the cast is stacked full of young talent. If that's not enough to have you begging for April to get here sooner, maybe this will. When asked about the film, Boone was quoted saying "it's a haunted house movie with a bunch of hormonal teenagers." Yeah, teenagers that know dark magic and turn into werewolves. This is going to be one hell of a ride and I'm already strapped in and rearing to go.